By the time war broke out with China on the northern border in February 1979, Lương Xuân Đoàn was a student at Vietnam Fine Arts College. The cultural policy at the time was to give artists broader social views and more experience. It was viewed that to be useful as artists, they must understand both the art world and real life. It was also deemed important that they should understand the conditions of previous generations. 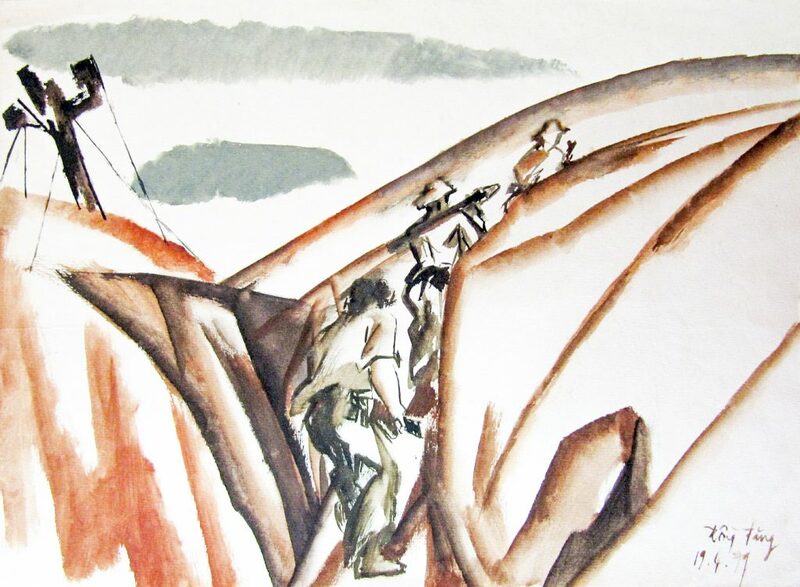 As a result, the Ministry of Culture collaborated with the Border Security Unit of the Ministry of Defence to send art students to battlefields. Đoàn was sent to Lạng Sơn. Đoàn lived with the soldiers at the border locations. 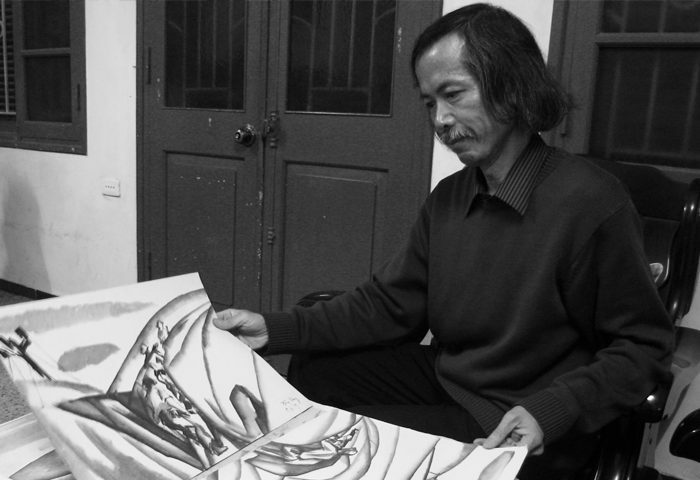 Đoàn described painting and sketching through direct observation while using his own style to render the scenes. Student works were exhibited both to the soldiers and local people, always in public venues, with the objective of raising the morale of both the army units and civilians. Figure 1: Lương Xuân Đoàn, 19 April 1979. Đồng Đăng, a town of Cao Lộc District, Lạng Sơn Province on the Chinese border. Watercolour on machine-made paper. Đoàn captures soldiers navigating the trenches at Đồng Đăng (fig. 1), which was the location of the Battle of Đồng Đăng from 17 to 23 February 1979. This battle was the initial phase of the Battle of Lạng Sơn during the Sino-Vietnamese War. A key strategic location used as a defensive position by the Vietnamese was a French-built fort, with 1.5 metre-thick concrete walls, positioned on a hill to the southwest of Đồng Đăng. The Chinese suffered heavy losses in trying to capture the fort, which they eventually managed on the evening of 22 February 1979, after unsucessfully trying to negotiate the surrender of the Vietnamese military inside. Approximately 800 soldiers and civilians inside the fort perished when it was destroyed by Chinese explosives, gasoline and flamethrowers. Comprised of two double pages, Đoàn interprets the fort and the surrounding countryside in his own style (fig. 2). In his description of the art work, Đoàn described it as the “steel fortress (pháo đài thép)”, used figuratively to describe the fort’s almost impregnable walls. Figure 2: Lương Xuân Đoàn, 1979, area near Đồng Đăng, a town of Cao Lộc District, Lạng Sơn Province on the Chinese border, “Pháo đài thép Đồng Đăng (Steel Fortress Đồng Đăng).” Watercolour on machine-made paper. Đoàn also gives a sense of the narrow confines entailed in fighting on the border (fig. 3). Figure 3: Lương Xuân Đoàn, 24 April 1979. Lạng Sơn Province on the Chinese border. Watercolour on machine-made paper. 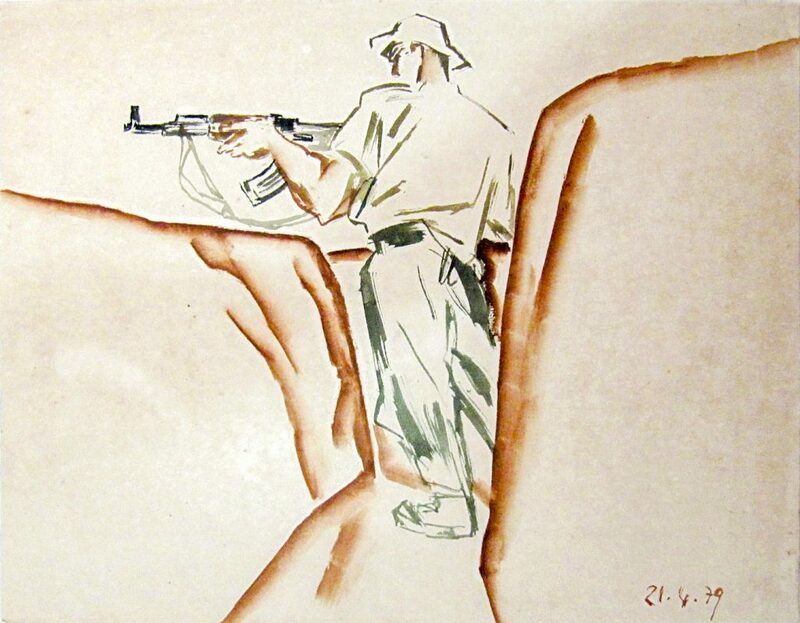 Art works and photographic records of the brief border war between Vietnam and China remain highly sensitive in Vietnam and are rare to come by.